Extra Mural Activities | Join our Extra Murals activities Today! An introduction for children to learn basic computer skills, terminology, keyboarding and mouse skills. Drama lets children experiment with language in different situations: whether it's speaking aloud to an audience, conveying ideas to a group or taking on an impromptu character. 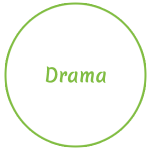 Drama is a dynamic practice that introduces children to a world of wonder and play. It encourages them to continue questioning, exploring and teasing out new ideas and ways of living and thinking. Jive Bunnys is a dancing school which was founded in 2017 and they give ballet, hip-hop and creative dancing lessons at an affordable price. Being able to swim is a highly valuable skill for children to have. In addition, it's a fun and enjoyable sport and a great form of gentle exercise. At Physkidz we offer a variety of different sports to help with your child's development. Our sports are also designed to teach kids new skills and confidence which they will be able to use once they go to school. We offer sports like soccer, netball, tennis, rugby, athletics and cricket. Information and enrolment forms for these extra mural activities will be provided on request but is dependent on school fees being paid up to date.